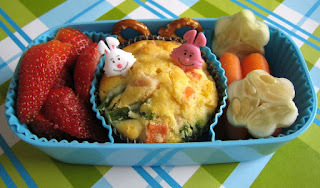 BentoLunch.net - What's for lunch at our house: A Quick Bento, and Some New Easter Picks! A Quick Bento, and Some New Easter Picks! We're having a relaxed Sunday right now. I spent yesterday baking (banana nut mini muffins, chicken & veggie stuffed muffins, and yellow cake cupcakes), so not a whole lot to do today. However, we did have to do a quick bento to show off our fun Dollar Tree find for Easter! Faith has a chicken & veggie stuffed muffin with cute new bunny picks! They are actually pegs from a game, but I'm OK with decorating with them. To go with, we added carrots and cucumber flowers, along with sliced strawberries and a couple of pretzels to hold things in place. The kids have both had their fair share of cupcakes and muffins already, so skipping the desserts till after dinner. Do you have a recipe anywhere for those stuffed muffins? My daughter is heading to preschool this fall and those would be perfect for her. You can use a corn muffin mix like Jif or make your own (I use this one http://www.bentolunch.net/2010/04/muffin-recipe-from-yesterday.html). Add to the batter about 1.5 cups of diced/shredded chicken (must be precooked) and another cup of frozen mixed vaggies, spoon into muffin papers and make. We do a bunch of variations on this--taco (cooked taco beef, but drained of the liquid with cheese) is Ben's favorite. Show me the bentos. We need more updates!